“Runes,” Astarra said to herself. She let the word hang in the air. The markings on her grandmother’s stone were no mere frivolous artistic endeavor. They held meaning, defined the stone’s power. The Orb of the Sky was the most powerful artifact that Terrinoth had ever seen. Created by the wizard Timmorran and also destroyed by him, when he realized that he had been betrayed by his friend Waiqar, who sought the artifact for its power, planning to use it to bend others to his will. When the orb was destroyed, its fragments were scattered across the world, rendering it almost unthinkable that anyone could ever recover them all and harness their combined power. Still, the shards had power of their own, and that power drew others to them. The dragonlords gathered as many as they could and bound runes to them, dedicating their powers toward specific tasks. Some of these shards might increase the strength of a weapon or a suit of armor. Others might give life to powerful golems. And yet others might be dedicated to tasks long since forgotten, disappeared after the dragonlords' defeat. This November 1 – 4, at the 2018 Runewars Miniatures Game World Championship, Terrinoth's greatest generals will discover a wealth of these runebound shards—and battle for them! 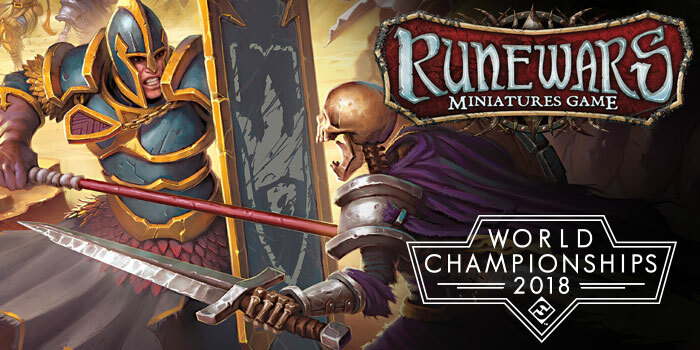 Taking place at the Fantasy Flight Games Center in Roseville, MN, the World Championships are the pinnacle of Runewars Miniatures Game Organized Play. The event is a showcase for the game's greatest players, strongest armies, and most effective tactics. 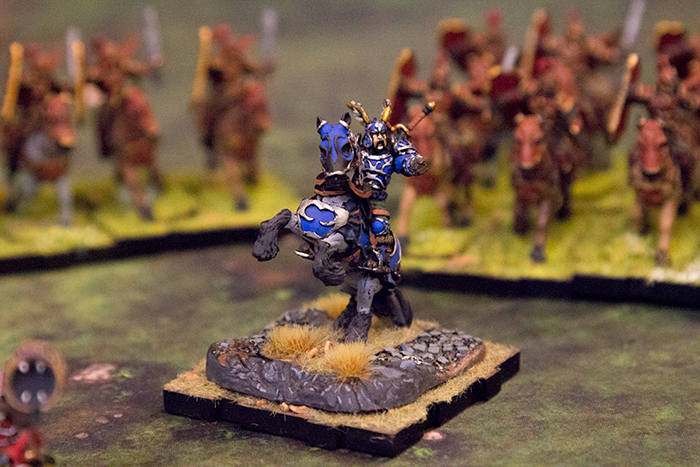 It's a chance for top artists to present their painted miniatures. And it's a chance for Terrinoth's generals to claim their share of powerful treasures! 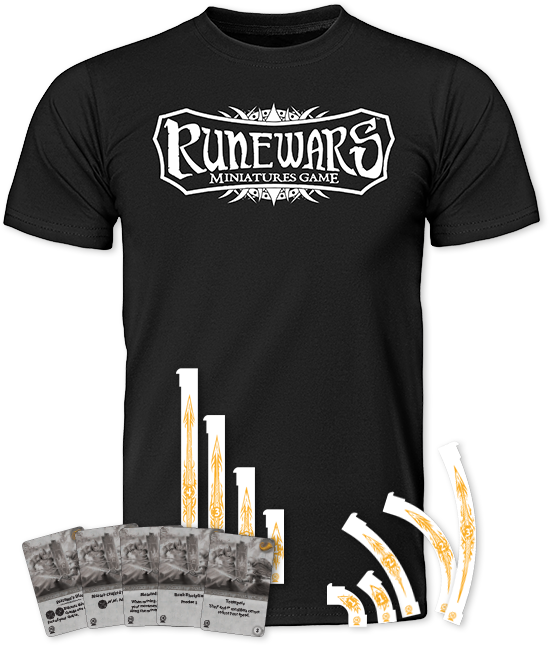 Each player who enters the battles of the 2018 World Championships will claim a participation prize package consisting of a commemorative T-shirt, a set of acrylic maneuver templates, and a set of five extended art cards: Rank Discipline, Master-Crafted Weapons, Fortuna’s Dice, Metered March, and Trumpets. Each participant will also have the opportunity to earn tickets to redeem for prizes from the event's prize wall, including a frosted plastic version of Ardus Ix'Erebus. In 2018, Runewars Miniatures Game World Championship attendees will find Terrinoth a land of many bounties—including the bounty prizes they'll claim for each of their wins. Each time a World Championships participant leads his or her forces to victory, that player will claim a set of five condition tokens. This means that over the course of the tournament's five Swiss rounds, a superior general could win as many as five sets of these tokens! The stakes at the 2018 World Championships are high enough that no army can afford to ignore them. Accordingly, the Daqan Lords, Waiqar's undying legions, the Latari Elves, and the Uthuk Y'llan will all need guidance, and each faction will acknoweldge its greatest general with a special reward—an acrylic range ruler with a white and gold pattern to match the maneuver templates. The Top 16 generals will find their victories rewarded with powerful shards—marked with runes and invested with the ability to serve as dice. Each of the Top 16 players will claim two sets of these custom dice. Terrinoth's Top 4 generals will earn custom mediallions to help them rally their strength and charge forward into their final battles. Additionally, each of these talented generals will receive an art print featuring the Uthuk Y'llan and Ravos the Everhungry, powerfully depicted by Jordan Kerbow. 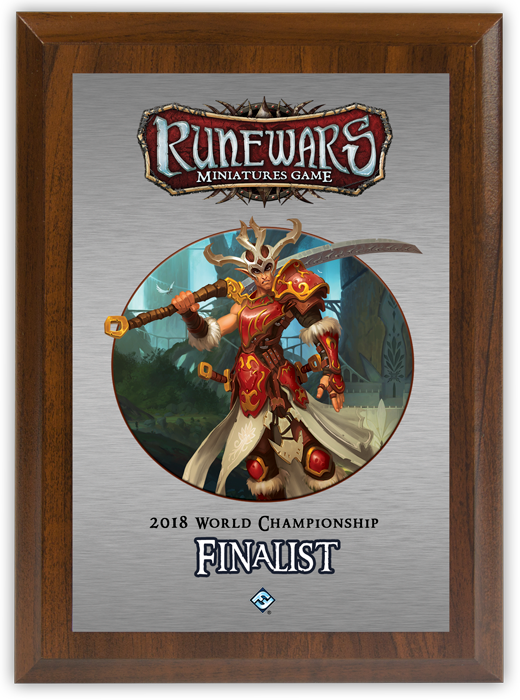 In addition to all the other prizes the 2018 Runner-Up wins during the Runewars Miniatures Game World Championship, he or she will claim a Finalist plaque adorned with an image of Prince Faolan of the Latari Elves. Finally, at the end of the tournament, one dominant champion will emerge victorious, having seized all manner of rune shards and driven all foes back from his or her borders. This inspiring leader will earn the title of World Champion, claiming also the array of prizes that accompany the title. 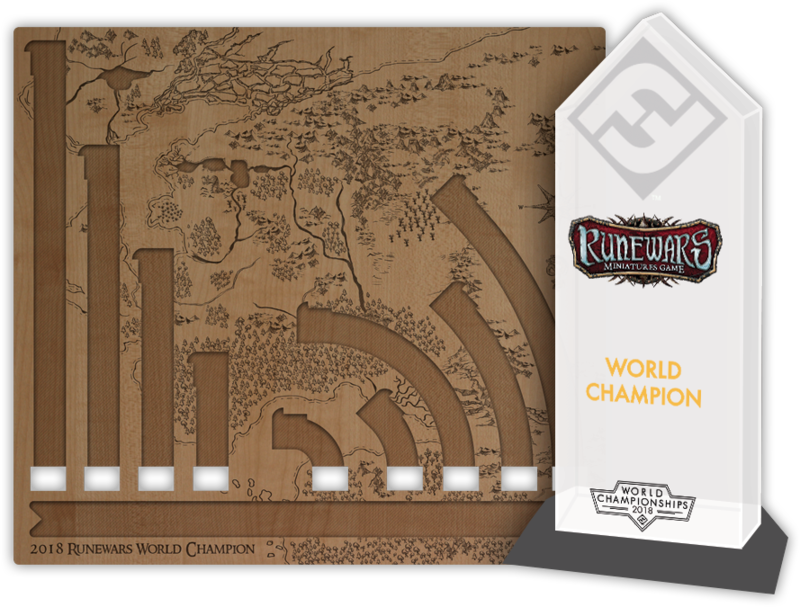 These prizes include a World Champion trophy, a wooden maneuver template tray with a map of Terrinoth engraved on its surface, flight and lodging for the 2019 Runewars Miniatures Game World Championships, and the Greatest Prize in Gaming—a chance to work with the game's developers to inspire the design of a future card! Just as Terrinoth's greatest commanders will be recognized for their valor and audacity on the battlefield, so will the factions honor their greatest artisans for their contributions. 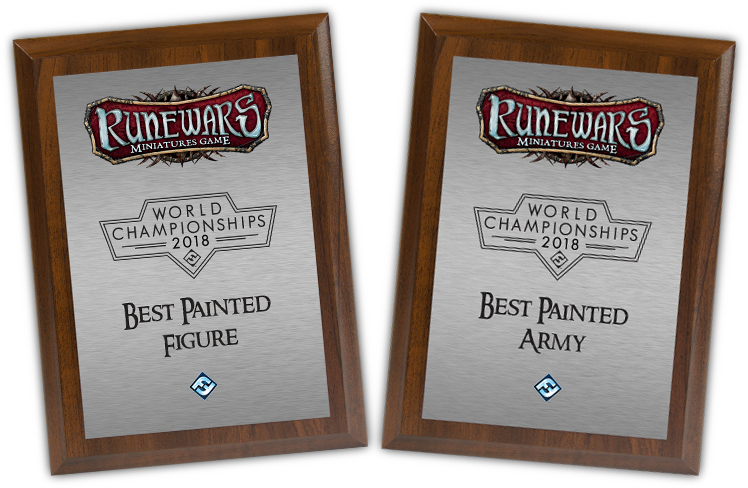 The 2018 Runewars Miniatures Game World Championship will recognize the most outstanding work in each of its Painting Contest's two categories: Best Painted Figure and Best Painted Army. The winners will receive plaques to commemorate the contributions they made to their armies' morale. The shards of the Orb of Sky offer power to those who wield them. But to claim their power, you must first win the shards. To win the shards, you must fight for them. The battlegrounds have been set. 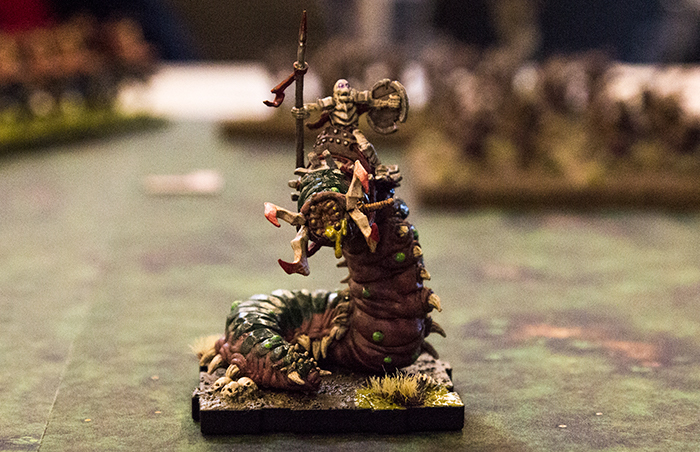 The armies of Terrinoth are on their move. 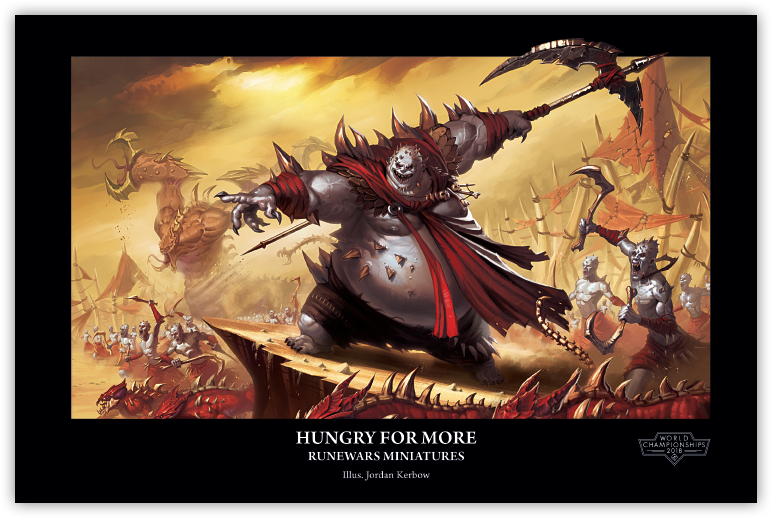 The 2018 Runewars Miniatures Game World Championship is fast approaching. Will you be there to lead your forces to victory? A very limited number of seats are still available. Register now to join the battle and stake your claim for Terrinoth's greatest prizes!